Hungry Donkey is suitable for vegans! We love our souvla spit roasted meat as much as the next donkey (bordering on an obsession some might say). 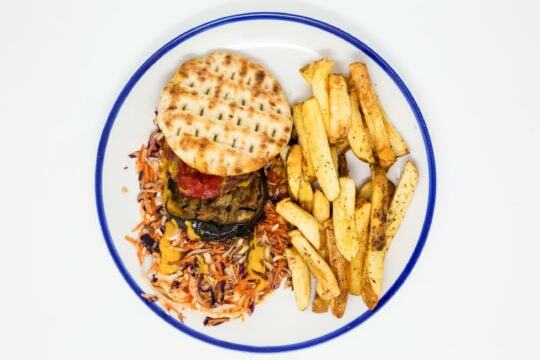 But this month we are branching out and exploring the veggie and vegan options available right here at your favourite Greek restaurant in London! Plant based eating has become so popular that days of the week have now been dedicated to it. Have you ever taken part in Meat Free Monday? Apparently eating meat free just one day a week can do wonders for the environment! We’ve put our chef hats on and done our bit, and decided now was as good a time as ever to show off our vegetarian and vegan menu. I’m guessing you’re picturing a menu full of salad? Not here at The Hungry Donkey. We like to think outside the salad box (although we do have some great salads too!). There’s so much more on offer at your favourite London Greek restaurant than you can even imagine. Luckily, a lot of traditional Greek dishes are already veggie friendly, so you can always rely on us to serve up the good mood Greek food. Vegan Gemista (oven roasted peppers filled with rice & herbs, served with oven potatoes). Vegan cocoa brownie (dairy and egg free mixed withextra virgin olive oil). There’s so much more to choose from … we should probably let you decide for yourselves what takes your fancy, read our menu in full here. There’s nothing wrong with enjoying some meat either, you can still get your daily dose of souvla or pulled pork whenever you fancy. We’ll keep providing guilt-free Greek food whether it’s vegetarian, vegan or the classics. There’s something for everyone at The Hungry Donkey – that’s what makes it everyone’s favourite Greek restaurant in London.